Eachine E57 Review - Is it better than other cheap palm drones ? Quite recently we had a look at Syma X21W. Most notable feature of that drone was its small size. Now we’re going to be talking about Eachine E57 Review, an even smaller drone. Both E57 and X21W fall well into my category of “palm drones”. E57 is about 5″ long, 2.5″ wide and only about 1″ tall with the blades folded out. It can even be made thinner by folding the blades in, to just 0.4″. 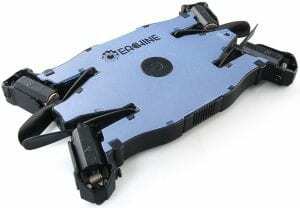 Eachine is a relatively well know manufacturer of drones and have decent support for their products. 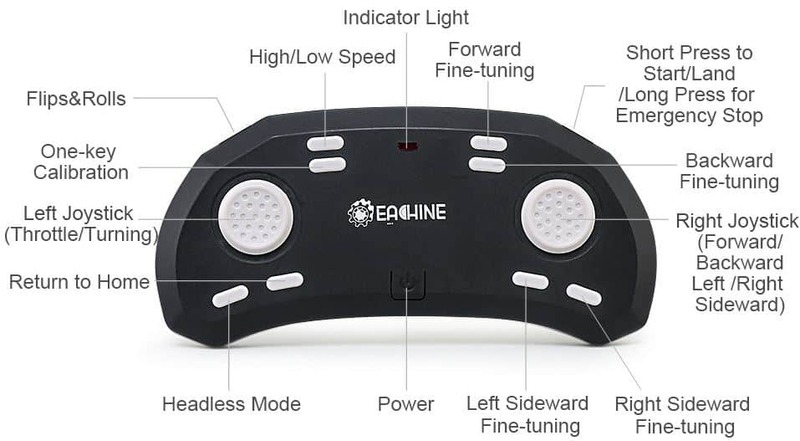 Eachine E57 has a rectangular design. Most drones are “squares”, with equal lengths and widths. Drone body is very flat. That is actually the whole idea behind E57. Eachin isn’t just aiming to be very small with E57, but also ultrathin. Notice those two slits at each end of the body? Those are grooves where the blades are placed when they are folded. This is how the drone looks like with the blades folded in. In this configuration it’s only around 0.4″ thick. Perfect for rucksack pockets, or even jacket pockets. Middle of the drone body has the power button. Drone head houses the camera. Camera has a pivot for adjusting its angle, 90°. In other words the camera can be positioned to face forwards, or straight down, under the drone. Let’s go over quick specs before digging in fully. What makes Eachin E57 an interesting buy? 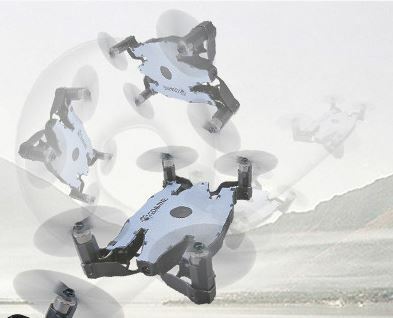 Small size – ultrathin small design makes the drone very portable and easy to launch in small/closed spaces. Good camera – 720p, 0.3MP camera produces nice photos and videos. Anti-shaking – camera has a very effective anti-shaking functionality that prevents wobbly video. FPV control – drone can be connected to a phone using the “Eachine Fly” app and flown from the app itself. Speed control – drone has speed control. Go slower or faster depending on need. The goodies – LED lights, headless mode, one-key return, altitude hold, flips & tricks. Drone is light – it only has around 36g. Don’t expect to add a third-party camera or to fly in any kind of wind. Built-in battery – battery on this drone is built-in, with a charging port on one end of the drone. Better camera – I know I said that camera is good, but I think that it could be better. Video can be grainy. Use of 2.4G wifi – 2.4G wifi that’s used for FPV and remote control limits the drone range. After getting the drone out of the box, you’ll need to pop the blades on it. They do come off, with the provided tool. One set of blades is in the package. Blades don’t have to be removed if you decide to store the drone. Folding tucks them away snuggly with the drone body, inside the aforementioned grooves, so they aren’t in the way. Inside the box you’ll also find the physical controller, charging cable, and a manual. I didn’t have any kind of problems getting the drone ready for lift off. Setup is very intuitive, and there’s also a manual to help out should you get stuck. Controller looks more like a game console controller. Only one set of front triggers is present. Right trigger is reserved for one-key start/stop and left trigger for doing flips and rolls. Main area at the top has the left joystick (throttle, turning), right joystick (forward, backward, sideward) and speed control, headless mode, return home, trim adjustment buttons. Controller feels cheap, is also very light and lets off those squeaky sounds, but it works. One drawback is that there’s no clip for the smartphone when using the FPV mode. You’re going to have to use your own. Camera is located at the front of the drone and is oriented forward. Sadly I wasn’t able to find a way to tilt it down, seeing how it’s embedded into the body of the drone. Camera has a 720p, 0.3MP sensor. 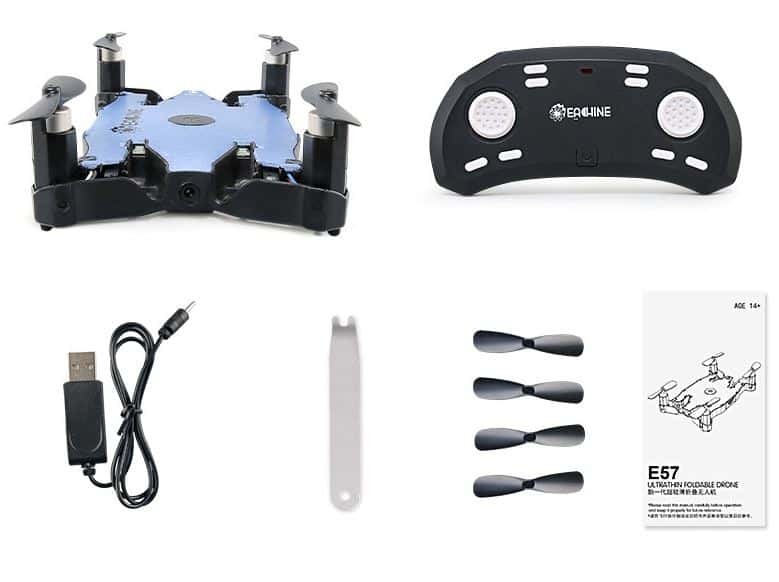 E57 is in part advertised as a selfie drone. There is even a camera “beauty mode” present in the app, that improves brightness and colors when taking photos. One thing worth noting is that camera has a very good anti-shaking function. Video is stable, without wobbling caused by the motor vibration. 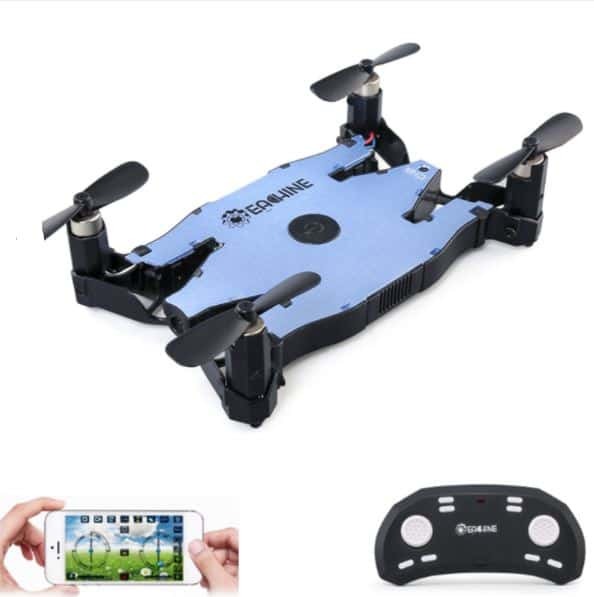 Eachine E57 drone supports FPV and it also supports drone control using the “Eachine Fly” smartphone app which is available for both Android and iOS devices. FPV and controls are all present on the same screen. FPV stream is actually the background of the on-screen controls. Check it out how it works on the image to the right. App has more controls on it than the physical controller. Drone is very responsive to controls given using the smartphone app. It’s just as good as the physical controller, but with more options. For example, Eachine Fly app has the G-sensor mode. This mode allows you to control the drone using the phones G-sensor. Eachine E57 has a lot of interesting additional features that will provide hours of fun for those looking to take selfies or have fun doing flips/rolls. Altitude hold will keep the drone at a steady, fixed height using internal barometric sensor. This will help take clear selfies. One key return function brings back the drone automatically from its starting position. LED lights in the front and the back of the drone make it easy to fly during night. Headless work mode is available. By activating the headless work mode you essentially deactivate the front and back sides of the drone. You don’t have to orient the drone head forward in order to move forward. Controller becomes the reference point for orienting the drone in space. It’s a great trick to make flying the drone easier for beginner pilots. Single button flips and rolls are also available. Drone is very easy to fly. Start it up by first turning on the drone, then by turning on the controller. Press the left joystick up/down in order to bind the drone to the controller. LED lights will stop flashing after binding is complete. Use the front right trigger on the controller to arm the motors and to take off. Once the drone is in the air, you can use the joysticks to give the drone altitude and right joystick to change direction. 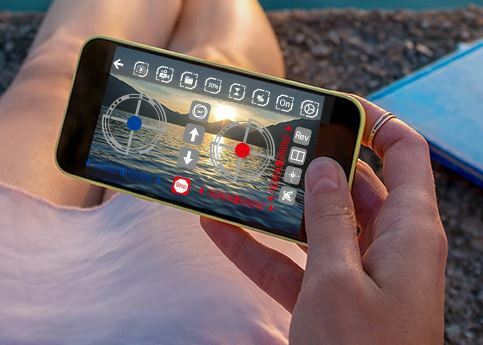 To use the smartphone app, connect to its wifi and you should see the FPV stream right away. How fast the drone is going to be depends on what speed setting you put it in. Two speed settings are available, slow and fast. Beginners will probably be better off leaving the drone in the slow speed setting. High speed setting can cause the drone to move very quickly. [REVIEW] JJRC H12WH – outstanding control range and flight time. But is that enough? [Review] Hubsan H502S – worlds cheapest GPS drone with follow me function?